The goal of the Internet of Things (IoT) is to increase the connectedness of people and things. The IoT is the network of physical things equipped with electronics, software, sensors, and connectivity that provides greater value and better service by exchanging data with the manufacturer, operator, and/or other connected devices. Each element of the network, that is, each thing, is uniquely identifiable through its embedded computing system and is able to interoperate within the existing Internet infrastructure. Things in the IoT can refer to a wide variety of devices such as biochips on farm animals, heart monitoring implants, production line sensors in factories, vehicles with built-in sensors, or field operation devices that assist firefighters. These devices collect useful data with the help of various existing technologies, then autonomously flow the data between other devices, and usually upload them into a data center environment for further processing. The IoT together with the collected and analyzed data can help consumers achieve goals by greatly improving their decision-making capacity via the augmented intelligence of the IoT. For businesses, the Internet of Business Things helps companies achieve enhanced process optimization and efficiency by collecting and reporting on data collected from the business environment. More and more businesses are adding sensors to people, places, processes, and products to gather and analyze information in order to make better decisions and increase transparency. Various sensors drive the IoT ecosystems and make the things active elements. They are our eyes and ears to what is going on in the world. IoT sensors are also expected to generate large amounts of data from diverse locations and various domains; for example, weather, transportation, and communication data can be aggregated, analyzed, and utilized for support different fields, for example, smart city services. Undoubtedly, the Internet of Things has reached and is about to dominate several domains. Top industries investing in sensors and utilizing data collected by them are as follows (some of them are still in active research phase, because of technical challenges and economic issues, but others are already being implemented). (i) Energy and Mining: Sensors continuously monitor and detect dangerous carbon monoxide levels in mines to improve workplace safety. (ii) Power &amp: Utilities. In the past, and mostly today, power usage is still measured on a yearly basis. However, Internet-connected smart meters can measure power usage every 15 minutes and provide feedback to the power consumer, often automatically adjusting the system’s parameters. (iii) Transportation and Vehicles: Sensors planted on the roads, working together with vehicle-based sensors, are about to be used for hands-free driving, traffic pattern optimization, and accident avoidance. (iv) Industrial Internet (Industry 4.0): A manufacturing plant distributes plant monitoring and optimization tasks across several remote, interconnected control points. Specialists once needed to maintain, service and optimize distributed plant operations are no longer required to be physically present at the plant location, providing economies of scale. This is one of the areas where significant improvements are expected in the near future. (v) Hospitality and Healthcare: Electronic doorbells silently scan rooms with infrared sensors to detect body heat, so the staff can clean when guests have left the room. Electrocardiography (ECG) sensors work together with patients’ smartphones to monitor and transmit patients’ physical environment and vital signs to a central cloud-based system. (vi) Retail: Product and shelf sensors collect data throughout the entire supply chain. They often provide from a dock to shelf logs. Predictive analytics applications process these data and optimize the supply chain. (vii) Technology: Hardware manufacturers continue to innovate by embedding sensors to measure performance and predict maintenance needs. (viii) Financial Services: Telematics allows devices installed in the car to transmit data to drivers and insurers. Applications like stolen vehicle recovery, automatic crash notification, and vehicle data recording can minimize both direct and indirect costs while providing effective risk management. Each of these sensor types provides significant benefits for the targeted domains; furthermore, based on the actual trends, we expect that they will support even more sophisticated use cases, making the urban life and smart spaces more livable, safer, and cost effective. Analysts expect that 50 to 100 billion devices will be connected to the Internet by 2020. According to a BBC Research report, the global market for sensors was valued at $79.5 billion in 2013 and is expected to increase to $86.3 billion in 2014, $95.3 billion in 2015, and nearly $154.4 billion by 2020, a compound annual growth rate of 10.1% over the five-year period from 2015 through 2020. The IoT is on the right way to be a major source of big data, contributing massive amounts of streamed information from billions of devices and sensors. Typical IoT applications that produce big data include vehicles and transportation, meteorology, experimental physics, astronomy, biology, and environmental science. For example, a Boeing jet generates 20 TBs of data every hour during a flight. An airplane has more than 300,000 sensors on board constantly generating data streams. Indeed, machine-to-machine (M2M) communication generates enormous amounts of Internet traffic. The availability of massive amounts of information streaming from billions of IoT devices inevitably and justly requires appropriate handling methods and techniques; furthermore, in certain cases, the sensitivity of the data brings up security and privacy concerns as well. 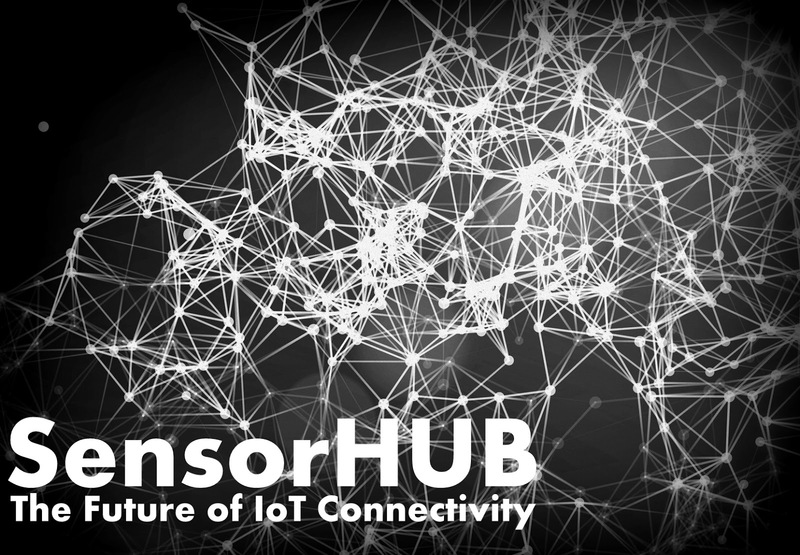 The SensorHUB framework is a collection of different technologies and is assembled as a tool chain to support IoT related development: collecting the sensor data, transmitting, processing, analyzing, and supporting the utilization for different purposes. The power and the uniqueness of the solution is that the framework is designed to be available via the Platform as a Service (PaaS) model; that is, server-side development, including data management and processing, reporting, push notification, data monetization, are available via a web browser. Currently, Integrated Development Environments (IDEs) still require to install them, follow updates, and usually cover only certain parts of the whole data management process addressed by the SensorHUB. A further advantage of the SensorHUB is that it makes it possible to develop and reutilize domain specific software blocks, for example, components for the health or the vehicle domain that are developed once and built into different applications. The framework makes these available by default and provides various features to support developers working in this field. In summary, SensorHUB provides both a method and an environment to support IoT related application and service development and, furthermore, emphasizes the importance of a data monetization approach, that is, providing the methods to define data views on top of different data sources and analyzed data. In this way, comparing to the available methods, environments, and frameworks, SensorHUB is a novel approach for more effective development in an emerging area.